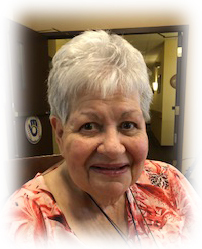 Janet M. Glenn, age 82, of Port Washington, WI peacefully passed away Friday, November 30, 2018 at Lawlis Family Hospice in Mequon. She was born on August 27, 1936; daughter of Ralph and Freda Louise Ellsworth Nelson in St. Cloud, MN. With her dad working in sales, Janet had lived in numerous states. Ralph and Freda Louise settled in Milwaukee when Janet was 14. Janet graduated from Messmer High School and attended Marquette University for a year. Janet married and lived in Frankfurt Germany where her husband was stationed in the Army. Returning to the United States Janet had five daughters. Janet was an amazing stay at home mom, active in Girl Scouts and school with her daughters. Later, her job in sales and real estate property management, took her to numerous states. She returned to Wisconsin in 1993 to be with her family. In 1996 she moved to Port Washington and lived at Marion Heights (now Anita’s Garden). St. Mary’s parish became her home. Janet had a strong faith and big personality. Active in the parish, a member of the Ushers Society and attending parish functions brought Janet joy to participate and be of service. She made many friends during those years. By 2009, Janet moved for the last time to Ellen’s Home in Port Washington. She is survived by her daughters Lisa Weinrich of Egg Harbor, Denise Smith of Mesa, AZ, Karen Bares of Belgium, Jill Lane of Houston, TX, Kristine (Greg) Dieter of Superior, CO. 12 grandchildren Elizabeth, Andrew, Emily, Eden, Cheyenne, Brittany, Ashley, Chloe, Dillion, Tommy, David and Steffany and 5 great-grandchildren, Star, Bianna, Azreal, Ana Mae and Ona Leigh; her sister Suzanne (Michael) George of Flagstaff, AZ, other relatives and friends. Janet is preceded in death by her sister Noreen Pesick (Jack) and her parents Ralph and Freda Louise Nelson. Her Memorial Mass of Christian Burial will be celebrated at 11AM Thursday, December 6, 2018 at St. John XXIII Parish-St. Mary Church, 451 N Johnson Street, Port Washington, WI. Reverend Thomas Lijewski will be the celebrant. Family will receive friends from 10-11AM Thursday AT CHURCH prior to the Mass. Interment will take place at Calvary Cemetery in St. Cloud, MN. Memorials to St. John XXIII Parish, 1800 N. Wisconsin Street, Port Washington, WI 53074 appreciated.